The Versailles Affair is based on one of the Mr. Suzuki novels by Jean-Pierre Conty. 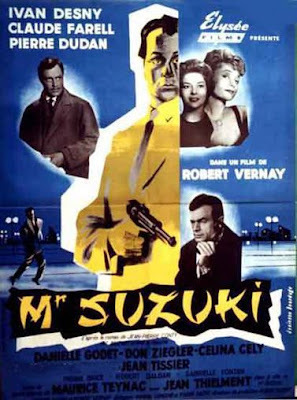 Actually the French title of the film is Mr Suzuki and I’m guessing it was aimed at being the start of a series that never materialized. The plot of the film has some important documents being stolen in Egypt. The documents reveal some sort of connection of the king to the oil companies. If the papers were made known they might change the course of an important political meeting being held at Versailles. They were stolen by a man whose motive is purely mercenary and operates outside of the typical channels. In order to recover the papers the authorities contact a troubleshooter named Mr Suzuki from Japan. That’s when things begin to get hairy. Oh how the world has changed in the 55 years since this film was made. First and foremost the role of Suzuki would not be cast by a Caucasian actor. I don’t think anyone would have a problem with the character being the smartest guy in the room, it’s just in these enlightened days you’d need a Japanese man to play him. Despite the fact that Jean Thielment plays him Suzuki as a killer character. He’s the sort of character you’d want to see in a series because he’s just so good at handling whatever is thrown his way. The other glaring sign of when the film was made is the fact that because of the lack of connecting flights, it takes the bad guy three days to get from Egypt to France. As stated at the start it’s a several day trip because of waiting for a connection out of Bagdad. Now a days there would be a flight or two every day- probably direct. It’s the lay over that allows Suzuki to get from Japan to France a head of his prey.